Nearly three years after my first ski trip out West, I joined another group of friends — John, Martin, Tom, Kristi, Betsy, Fran, and Martin’s brother Bill — in a triumphant return to Park City, Utah. Our flight reservations were affordable and stress-free; I booked a round-trip, nonstop flight from Philly for an astounding $215 through Orbitz, and was pleasantly surprised by Delta’s customer service. Despite my previous status on the no-fly list, I was suddenly able to print my boarding pass at a self-service kiosk, but my good fortune didn’t last long. I was still pulled aside at the security checkpoint, where I learned that a few toiletries in my carry-on backpack exceeded the three-ounce rule, which I had completely forgotten about. As for lodging, our group was fortunate to rent our friend Melanie’s cousin’s condo — the same stylish, comfortable place in which I’d stayed in 2006. During some of the downtime during our seven-night stay, we watched a handful of movies (Gran Torino was full of dark one-liners yet surprisingly moving; Night at the Museum was disappointingly childish) and enjoyed some relaxing meals at home, including an delicious lasagna courtesy of Bill’s culinary prowess. But enough about that; let’s get to the main event. 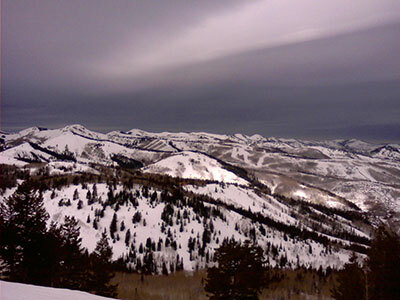 I ventured onto the slopes on four of our six non-travel days, spending two days each at Deer Valley and Park City. Given my previous struggles at The Canyons, I sold my pre-ordered lift ticket to John and spent a wonderful day on a solo trip to Deer Valley, which has become my favorite of the three resorts in the area. During our first few days, we were surprised to encounter temperatures above 50°, but our patience was rewarded with heavy snow and cold weather toward the end of the week. There was no shortage of excellent eating establishments — we enjoyed more than one visit at both Bandits Grill & Bar and the No Name Saloon on Main Street. (During our second meal at the No Name, I got to watch the resurgent Penn State men’s basketball team capture a thrilling 64–63 upset victory over No. 23 Illinois, thanks to a dramatic bank shot with 0.3 seconds left!) But Kristi, Betsy, Fran, and I were disappointed to learn that our highly anticipated dinner reservation at the Viking Yurt had been cancelled due to low enrollment that night, so we opted for a very good but overpriced Southwestern-style dinner at Chimayo on Main Street instead. On the night of our return home, Daylight Savings Time went into effect, costing us a much-needed hour of sleep after a fun but exhausting trip. And although we all had a blast in Utah, I was glad to be back home again, and I’m already looking forward to spring! In the midst of a thoroughly frustrating and depressing winter, I was grateful for the opportunity to spend a fun Saturday night out with friends in Old City. We enjoyed a delicious, reasonably priced dinner at the Mexican Post, then walked a few doors down to Buffalo Billiards, where we played some pool and table shuffleboard. But the highlight of the evening took place at a small, second-floor venue on South 2nd Street called the Tin Angel, where my favorite band, Fountains of Wayne, put on a rare acoustic performance. Our group of six attended the 10:30 p.m. show, the second of the night. Since we didn’t opt to eat dinner at the downstairs restaurant (called Serrano) before the show, we had to settle for some cramped seats toward the back of the narrow hall. But when a venue only holds about 100 people, even the nosebleed seats are terrific! * Fountains of Wayne accompanied by Mike Viola and Kelly Young. The opening song title was perfect for an acoustic show, and I was thrilled to hear “Little Red Light,” one of my FOW favorites, live for the first time. For the crowd-pleaser “Hey Julie,” three audience members were invited to assist the group on percussion (much like the roadies back in 2004). The band sheepishly joked about “Valley Winter Song” and its placement in a recent L.L. Bean ad, and played a wonderfully subdued version of their well-known hit, “Stacy’s Mom” (my friend John aptly compared the piano-based arrangement to the classic sound of Burt Bacharach). Based on the four new songs that we heard, I’m really looking forward to the release of their next album, which is tentatively slated for later this year. Thank the Lord for great friends and outstanding music on a cold winter night. On the last two days at work, I’ve placed completely different orders for lunch in our cafeteria, yet the total cost of each meal came to exactly $6.66. Should I be concerned? In an exclusive interview with ESPN’s Peter Gammons on Feb. 9, Yankees third baseman Alex Rodriguez admitted to using steroids during his days with the Texas Rangers in 2001–03. But you knew that already, right? See, A-Rod, that’s exactly the problem. Maybe you should think twice before taking any medicine at all. When I was in high school, I worked part-time at a Waldenbooks store in the Exton Square Mall. As I rang up customers’ purchases, I frequently noticed old and unusual coins in the drawer of the cash register. Since I had a coin collection at home, I would secretly swap the old coins with an equal or greater amount of new change from my pocket — that always seemed fair to me. The older coins that I smuggled home were never really valuable, but I found them interesting. One of my favorites resembled an ordinary U.S. cent, but was actually a 1911 farthing (one-fourth of a British penny) with the likeness of King George V on the obverse. I still have it! Most people never notice them, but you wouldn’t believe how many old coins are still in circulation. I must confess that I still swap out old coins once in a while, but my habit now takes place in the “take a penny, leave a penny” dishes next to cash registers. So, I thought it was an interesting coincidence that today, the 200th birthday of Abraham Lincoln*, I spotted a Lincoln wheat penny in the dish next to the register in our cafeteria. And just like before, I made the switch and took the 1957D coin home with me. * Note: Before reading the news today, I never knew that Lincoln and Charles Darwin were both born on Feb. 12, 1809. Strange! I’d like to take this opportunity to thank the individuals who spray-painted graffiti all over a pair of detached garage enclosures near my residence on Friday night. (The garage that I own happens to be located a little farther away and was left untouched.) The same people apparently also vandalized a Mercedes in the parking lot, although I didn’t see their vehicular handiwork. Your freshly painted “tags” have added a much-needed artistic flair to our otherwise drab, ochre garage doors. In fact, if you return to our neighborhood for another unannounced exhibition of your talent, we’ll make sure that the local police have a chance to admire your work as well. The lack of original ideas among Hollywood movie studios is hardly new, but this week’s release of The Pink Panther 2 is a new low. After the poorly reviewed Pink Panther remake from 2006, why do we need another ersatz companion to the hilarious classics that starred Peter Sellers? And although I respect the prolific talent of Steve Martin, I have to rebuke him here. Seriously, Steve, you’re better than this, and unless you have a lot of investments with Bernie Madoff, you can’t possibly need the cash. Since I moved into my first house in Chesterbrook in 2004, I’ve developed a frequent, enjoyable habit of taking long walks in Valley Forge National Park, which is a short distance from a path in my backyard. Depending on the weather, I rarely pass more than two or three people during my typical 35-minute round trip. But when I do see other folks in the park, the majority of them are accompanied by one or two dogs. Which is fine. Usually. The owner mutters a half-hearted apology and/or gives me a dirty look, then takes the leash that they were carrying and attaches it to their dog as I walk past them in quiet frustration. This has happened to me on several other occasions, and I’m amazed at the consistency of this exchange. First of all, you do not and cannot know for sure how your dog will interact with me. I’d love to assume that your pet is well-behaved and is only trying to be friendly, and that’s probably true most of the time. However, dogs are still animals that can be fiercely protective of their owners, and as a result, they can behave in ways that even you can’t predict. And when I ask you to use a leash, please spare me your withering looks and lame excuses. I’m simply asking you to follow the rules, which are designed to allow everyone to enjoy the beauty of Valley Forge in equal measure. This is a national park, not a neighborhood street. I know all of this might sound harsh, and I’m not blaming the dogs here; they don’t know any better. And I’ve walked past many thoughtful people who use a leash and even step aside to provide me with extra room to walk past them and their pets. But I’ve simply run out of patience with selfish pet owners who think that they’re beyond reproach. You have every right to be a “dog person,” but please understand that not everyone else feels the same way. [Y]ou are exactly right about dogs needing to be kept on a leash. And this comes from a “dog-loving” family. The dog could be hit by a car [or] could get hurt by an unfriendly animal. It’s just not safe. By the way, I totally agree with your viewpoint on dogs. There is a guy in my neighborhood who walks two rottweillers and a Great Dane — all at the same time. I always have to cross to the other side of the street when I see him coming because he can’t control all his dogs — and they are all on leashes. If there is another dog walker or a squirrel, or even if you make a sudden movement, it freaks them out. Although as I’m rereading this, I’m not sure why I cross the street and he doesn’t! Whew. I’m relieved to hear that some other people (dog owners and otherwise) feel the same way as I do.